"As if appearing in a dream, a stream of wolves emerged from the forest edge." So begins this exhilarating journey to one of the planet's most spectacular regions—Canada's North Pacific coast, our largest intact temperate Rain Forest and one of the last places where wolves live wild and undisturbed. Award-winning writer and wildlife photographer Ian McAllister draws from his intimate observations of more than forty wolf packs along this rugged coastline over a seventeen-year period in this first-ever documentation of their fascinating, complex way of life. In a compelling narrative and more than 100 stunning photographs, McAllister captures these majestic animals fishing for salmon, stalking seals hauled out on rocks, playing on the beach, and raising their families. 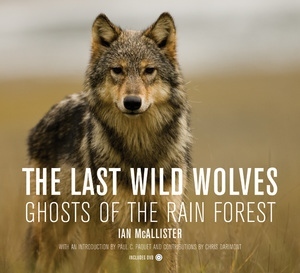 The Last Wild Wolves also describes the work of scientists whose recent findings have corroborated McAllister's own observations and the traditional knowledge gleaned by First Nations people over centuries—that these wolves are genetically distinct; unlike other wolves, they subsist on coastal prey and swim from island to island in their archipelago home. The Last Wild Wolves is a remarkable portrait of the unique lives of island wolves and an eloquent expression of just how much is at stake in their preservation. A founding director of the Raincoast Conservation Society, Ian McAllister has spent 20 years working to conserve British Columbia's temperate Rain Forest. He is the author of The Great Bear Rainforest. McAllister and his wife, Karen McAllister, were named by Time Magazine as "leaders for the twenty-first century" for their efforts to protect British Columbia's Rain Forest.